Adventurer Andy Strangeway, from Full Sutton, East Yorkshire, is behind the idea of installing the plaque. Western Isles council, Comhairle nan Eilean Siar, said there were no objections to the proposal and wished him well. 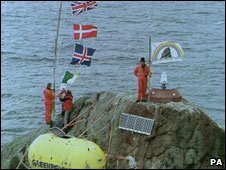 Last year, bad weather prevented a team of Belgian radio enthusiasts from landing safely on Rockall. They had hoped to make a series of amateur communications from the islet. UK sovereignty extends to the 12 nautical mile territorial sea around Rockall, under the provisions of the UN Convention on the Law of the Sea.